The chairman of the House Armed Services Committee says it’s not President Donald Trump’s fault his defense budget proposal is billions below what the military needs. The U.S. Navy conducted a failed ballistic missile intercept June 21 with its SM-3 Block IIA off the coast of Hawaii. The U.S. State Department is in the final stages of clearing the sale of 22 MQ-9 drones to India, with an expectation that U.S. President Donald Trump will announce the sale during the upcoming visit of Indian Prime Minister Narendra Modi. Aequs announced it is doubling the output of the Rafale fighter jet to help reach its goal of tripling annual sales to $300 million by 2020, said Aravind Melligeri, chairman and CEO of the Indian precision engineering company. Bombardier is betting on its Global 6000 for the U.S. Air Force’s JSTARS and Compass Call programs, but that doesn’t mean the model will be its offering for other upcoming U.S. special mission aircraft requirements, the company’s vice president of specialized aircraft said June 21. Italy’s Whitehead Sistemi Subacquei S.p.A., a subsidiary of Leonardo, might be reconsidered to supply Black Shark torpedoes for French Scorpene submarines currently being built in India, according to sources in the Indian Ministry of Defence. MBDA is due to deliver this year to a client country its system architecture for a ground-based air defense capability, dubbed network-centric engagement solutions, or NCES, said Franck Seuzaret, head of the company’s battlefield and air defense systems unit. Northrop Grumman has demonstrated a mine-hunting sensor mounted on an unmanned craft. During the Paris Air Show this week, German government officials met with Lockheed Martin to talk about the F-35 Joint Strike Fighter, a source connected to the program told Defense News. The F-35s premier performance in the skies above Le Bourget Airport is Lockheed Martin’s answer to years of assertions that the fifth-generation stealth fighter is a waste of taxpayer money and will be no match for potential adversaries. Lockheed Martin is “very optimistic” over prospects to win a helicopter tender in Poland, as its local unit could build the Black Hawk swiftly, according to John Rood, the company’s senior vice president for international affairs. Now free of restrictions over the announcement of contracts in the run-up to the general election in the U.K., the Ministry of Defense has confirmed that it has signed a deal with a Leonardo-Hensoldt team to equip the British military with a new generation of identification friend or foe systems. Danish firm Terma and Marvin Engineering signed a memorandum of understanding June 21 at the Paris Air Show, confirming the former’s continued involvement in the production of F-35 Lightning II fighter jets. Sofradir will supply key components for infrared detectors on the Talios targeting pod, one of the upgrades for the Rafale F3-R fighter jet due for delivery next year, said Philippe Bensussan, chairman of the French specialist in military and civil infrared detectors, or IR. Textron is demonstrating a 20mm cannon on its Scorpion twin-jet ahead of the U.S. Air Force’s light attack OA-X experiment later this summer. Three influential figures in Indian defense circles delivered the message that while maintaining a pragmatic set of alliances, New Delhi is also in the market for a strategic partner to work with its private defense contractors to significantly upgrade its capabilities to counter China specifically and other regional threats. Six3 Systems has been awarded a $10.5 million Army contract to develop equipment for future infantry squads. Lockheed Martin has been awarded a U.S. Air Force contract to sustain Sniper and LANTIRN targeting pods for foreign customers. The Pentagon said June 23y it was reviewing recommendations from the U.S. military chiefs that included calls for more time to implement plans to allow new transgender recruits to join the U.S. armed forces. The U.S. Army intends to hold a competition to replace its Patriot air-and-missile defense radar and plans to begin analysis of materiel solutions in fiscal year 2018, according to a service spokesman. The U.S. hasn’t seen a flying ace since Vietnam. Rising tensions in Syria and the proliferation of drones has some calling into question the U.S. military’s policy on awarding aerial combat victories. A Marine Corps F-35 squadron is back flying after software glitches grounded planes at Yuma Air Station in Arizona for a day. Marines are set to launch a 3-D-printed drone into combat zones in the coming weeks, reports 3D Printing Industry. The drone, nicknamed the “Nibbler,” is the first drone of its kind to be used in a combat theater by conventional forces. Rep. Mike Rogers, R-Ala., believes the Air Force is getting in its own way when it comes to advancing space operations. U.S. House Armed Services Committee chairman Mac Thornberry said he is “moving ahead” with plans to mark up the panel’s fiscal 2018 defense policy bill at roughly $705 billion—some $37 billion above the president’s request. It’s time to rethink a veteran disability system that “incentivizes disability,” Veterans Affairs Secretary David Shulkin said during a June 23 forum in Washington, the same day President Trump signed new VA accountability legislation. President Trump signed into law Friday sweeping new employment and whistleblower rules for the Department of Veterans Affairs, a measure supporters touted as a dramatic cultural change for the bureaucracy but one whose impact will likely take months or years to be seen. Airman 1st Class Rudy Redd Victor, who was stationed at Holloman Air Force Base in New Mexico, went missing in 1974. Staff Sgt. 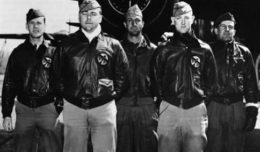 Byron Nelson, an airman with the Iowa National Guard, is finally returning home — more than 73 years after being shot down on a bombing mission during World War II, the Iowa National Guard said in a press release. A former U.S. Navy deep sea diver from northern Indiana who survived a 1985 airplane hijacking has died. President Trump on June 21 nominated Marine Corps veteran Thomas Bowman to serve as the No. 2 ranking appointee at the Department of Veterans Affairs, potentially giving the administration another high-ranking official with inside knowledge of the department. The owner of a New Jersey computer training center has admitted stealing $2.8 million from a program designed to help veterans find employment. Army Staff Sgt. Travis Mills awoke in a hospital on his 25th birthday to learn that an explosion in Afghanistan had robbed him of all four limbs. He later told his wife to take their daughter and their belongings, and just go. He didn’t want her saddled with his burden.